Kennedy Street, Wardsville, ON. Visit the Tombstone barn quilt block at Wardsville’s Historical Cemetery. The Ward family has graciously sponsored this barn quilt block to honour their ancestors, George and Margaret Ward and descendants. Tombstone “George Ward 1743-1837”. In 1837, George Ward died and was laid to rest near his homestead. His place of burial is now known as the Wardsville Municipal Cemetery and it is the resting place of some of the oldest families in Wardsville. George Ward’s resting place in the cemetery is 100 feet from the original site of his home and tavern here in Wardsville. The Ward family erected the current tombstone in the 1900s. 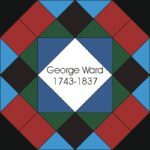 George Ward’s burial place is a testament to the complete and eventful life he dedicated to the formation of Wardsville. The original settlement and his place of burial is part of the legacy George Ward leaves us today.